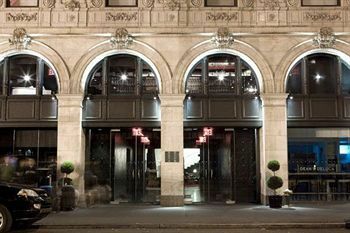 Paramount Hotel Times Square New York is located in the Broadway - Times Square neighborhood of New York, close to Minskoff Theater, Broadway, and Times Square. Nearby points of interest also include Rockefeller Center and Radio City Music Hall. Dining options at Paramount Hotel Times Square New York include a restaurant and a bar/lounge. Room service is available during limited hours. Recreational amenities include a health club and a fitness facility. This 4.0-star property has a 24-hour business center and offers small meeting rooms, limo/town car service, and audio-visual equipment. Wireless Internet access (surcharge) is available in public areas. This New York property has 496 square feet of event space consisting of conference/meeting rooms. Guest parking is available for a surcharge. Other property amenities at this Art Deco property include a coffee shop/café, valet parking, and a concierge desk. This is a smoke-free property. A total renovation of this property was completed in June 2009. There are 599 guestrooms at Paramount Hotel Times Square New York. Beds come with pillowtop mattresses, Egyptian cotton linens, down comforters, and premium bedding. Bathrooms feature designer toiletries, bathrobes, and hair dryers. Wireless Internet access is available for a surcharge; guestrooms also offer cordless phones and in-room safes (accommodate laptops). 32-inch LCD televisions have premium satellite channels, Oncommand video, and pay movies. Air-conditioned rooms also include iPod docking stations, blackout drapes/curtains, electronic/magnetic keys, and irons/ironing boards. Guests may request hypo-allergenic bedding and wake-up calls. Housekeeping is available. Guestrooms are all non-smoking. The Paramount Hotel is proud to unveil our April 2009 renovation, which includes new furnishings, clean, modern decor, exquisite bathrooms and luxurious linens throughout our entire boutique Times Square hotel. Even our most loyal guests will be amazed at the transformation! The sleek, stylish guest rooms at the Paramount Hotel in New York City’s Times Square are infused with modern sensibility and design, yet stay true to the playful, original spirit of The Paramount Hotel. The Paramount was built so that visitors could experience serenity in the exquisite simplicity of their Midtown Manhattan boutique hotel room or suite.